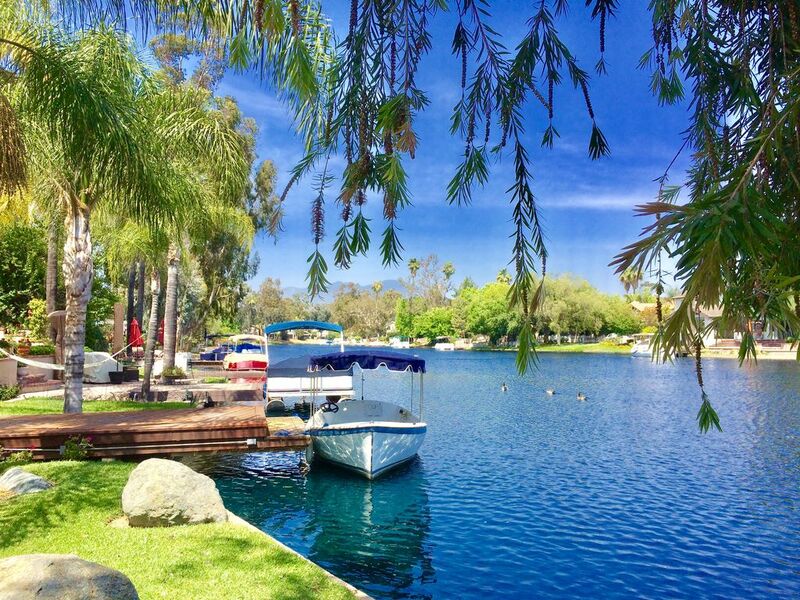 Located right on the water with breathtaking lake views, lush garden and its own private patio, boat dock & boat, this elegant villa is a completely remodeled two story home with 4 bedrooms, formal living room, family room, dining room and gourmet kitchen. Views of the lake, magnificent white swans swimming on the lake, and the surrounding garden will make for a magical and memorable holiday. Enjoy the stunning boat parades during all major holidays from the comfort of your living room, master bedroom and patio. Duffy electric boat seats 8 and is great for ultimate sunsets, relaxation and fishing. This 2500 SF open floor plan Villa has a private gated entry, travertine and exotic hardwood floors throughout with soaring vaulted ceilings. The amazing kitchen is rich with custom cabinetry, beautiful counter tops, breakfast bar, center -island and high end stainless steel appliances. The living room has large bay windows with magnificent lake views, a fireplace, and French doors leading to the large private lake front patio and boat dock. The large family room located immediately next to the kitchen with new LG flat TV, luxurious leather seating and views of the garden. The master suite has breathtaking views of the lake from the room and balcony, three large closets and dressing area. The master bathroom has an over-sized claw tub, separate marble shower, an antique custom dual vanity with marble surface and satin gold fixtures. * A private lakefront terrace, outdoor lakefront seating and dinning area, landscaped garden and BBQ facilities are available for guest use. * Free Wi-Fi and flat-screen HD cable TVs are provided throughout the property. * Convenient free parking available for 2-3 cars directly on our driveway. * Two zone central air conditioning and heating allows guests to set temperature separately for each floor for their comfort. * High end washer/dryer plus iron and ironing board available in this villa for your convenience. Listed on Homeaway since 2008, this amazing one of a kind property was remodeled in 2017 and 2018. Situated among Palm trees in a majestic garden setting, you can view the lake and the amazing water views even through front door and throughout inside. toilet, combination tub/shower, Large Claw tub plus separate shower with three shower heads. Our own exclusive boat at the villa is available for your use at no additional charge. Several Golf clubs within 5-10 minutes driving. We stayed here one week during spring and it is a gorgeous house with an amazing outdoor entertaining space and the location is truly marvelous! Our group loved this house! It is much larger than it appears in the pictures. Spectacular views of the lake and the garden throughout. There isn't a bad view no matter where you are! Feels like a tropical paradise. Perfect interior is spotless and so tastefully done. Very high end property. We really enjoyed our stay and would happily book again in a heartbeat! We enjoyed a wonderful holiday with extended family, it made for the most ideal get together for all ages. Clean, chic, spacious, amazing decor, great views, and perfect location. The view on the patio/deck whether day or night is remarkable. Outstanding customer service and communication. Hope to book again. What a great place! Had my family of 6 people stay in this spectacular property for a week. The location could not be better. The large kitchen/dining/family room area was perfect. The use of their Duffy was an added bonus. We took it out every day and some nights. The lakefront patio area was a favorite by all. Restaurants and shops all within a 5 minute walk. Pat was a pleasure to deal with. She made everything very easy. I highly recommend this beautiful home. 2nd year in a row at this wonderful property. This is a beautiful and luxurious modern lakefront home with incredible views. High end features and a perfect vacation destination. We will be back again son. We enjoyed staying at this location, with ducks and geese greeting you on the patio. Very peaceful and fun pottering around on the boat. Pat was very helpful and even picked up some basic provisions after our international flight. We booked this wonderful place for the entire month of June. We stayed with our 2 young kids and the nanny. Pat is friendly and very helpful. She provided us all information for having a wonderful stay. The location is fantastic with a club sandy pool which is even better than the real beach for young kids. The property is only fifteen minutes by car to Disney resort, so you can easily go there during the afternoon after having spent the morning on the club beach. Situated between Los Angeles and San Diego, the place offers you limitless options for actives to the whole family. The whole vacation was great. It is definitively a place we would recommend. Exclusive HIDDEN LAKES community of Lake Forest. STAY ONE WEEK, GET SECOND WEEK AT 30% OFF: - Please inquire first so I can email you a discounted quote. - Discount applies to all months except July and August. Overall pricing rules: No Taxes. All utilities included. Electric Duffy boat is exclusive for this villa and included in rental rates. No additional boat fees.